The Zoom MS-60B MultiStomp bass guitar pedal houses all of the big bass tone-processing power you could ask for in the size of a single stompbox-sized pedal. Choose from 58 modeled effects and amplifiers to create your ideal bass tone. A large LCD screen makes the MS-60B easy to use in any lighting condition. Right out of the box, this Zoom processor has 30 presets that are ready to deliver the low end on any stage and 50 user presets, so you can design and save your own sounds. From rock to funk to metal, the MS-60B is ready for any gig. Replace your entire pedalboard with the power of the Zoom MS-60B MultiStomp bass guitar pedal. With the combination of six amp models and 52 stompbox and rack effects, the Zoom MS-60B MultiStomp bass pedal is ready to dish out the sounds you need at your next gig. Amp models range from modern to vintage with detailed cabinet models. Every aspect of the bass amp and cabinet can be tweaked to create your own signature rig. Bass-tailored effects include distortion, compression, modulation, filters, delay, reverb, and more. You can use up to six effects and models simultaneously for big, lush sounds. Create a fat reggae rig or a overdriven rock rig, whatever you need the Zoom MS-60B MultiStomp can deliver. 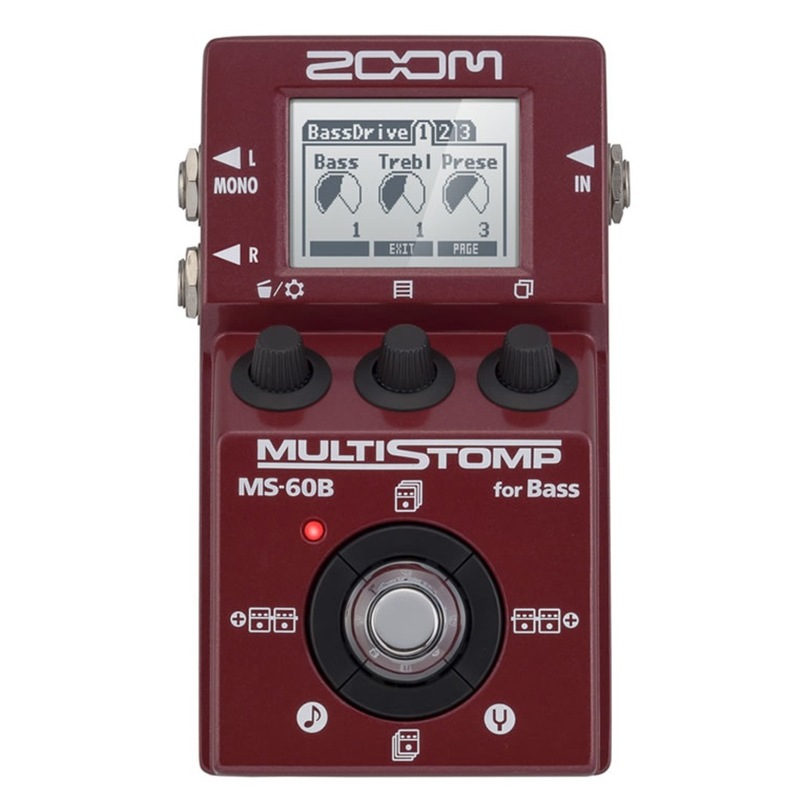 The Zoom MS-60B MultiStomp bass guitar pedal has a large LCD display built-in, so you can instantly see your settings. Youll love being able to see exactly what your presets settings are with this big, backlit display. Theres nothing worse than having to guess how your knobs are set and messing everything up at a show. Three parameter controls let you tweak settings quickly. A set of cursors built-in around the footswitch let you dig deeper into presets and functions on the Zoom MS-60B MultiStomp bass guitar pedal.